A study of a horse, full length, standing in profile to the right, with vertical lines indicating proportions; a study of the chest and part of the near fore-leg of a horse, and a slight sketch of the same; a study of the chest and off-fore leg of a horse, facing the viewer, with the neck and near fore-leg slightly indicated; some notes. Melzi's 103. Leonardo da Vinci was the archetype of the ‘Renaissance man’ - a painter, sculptor, architect, anatomist, engineer, map-maker, and student of geometry, optics, hydraulics and botany. Drawing was central to his researches, and the six hundred sheets by Leonardo at Windsor, covering all aspects of his activity, are the greatest treasure of the Royal Library. All the drawings and manuscripts in Leonardo’s studio at his death were bequeathed to his pupil Francesco Melzi, who took them back to his family villa near Milan. After Melzi’s death, around 1570, the collection was sold to the sculptor Pompeo Leoni (c.1533-1608), who pasted the drawings into the pages of several albums. These were dispersed some time after Leoni’s death in Madrid, and one was brought to England, probably through the agency of Thomas Howard, 2nd Earl of Arundel, who owned the album by 1630 (though there remains the possibility that it was acquired in Madrid during the visit of the future Charles I in 1623 - either by Charles or by his companion, the 1st Duke of Buckingham - and like the Holbein volume subsequently passed to Arundel). During the Civil War, Arundel left England, and there is no further trace of the Leonardo volume until 1690, when it was recorded at Whitehall Palace. How the album entered the Royal Collection is unknown, though it is most likely that it was acquired by Charles II. Some time during the 1480s Ludovico Sforza, the ruler of Milan, commissioned Leonardo to execute an enormous bronze equestrian monument to his father Francesco. Leonardo initially planned to portray the horse rearing over a fallen foe, an unprecedentedly ambitious design that he abandoned around 1490 in favour of a more traditional pacing pose. 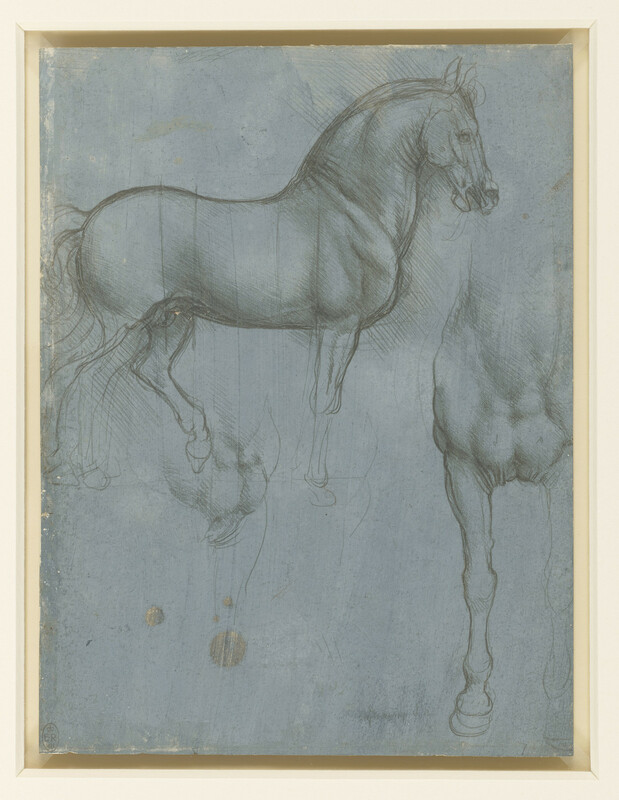 At this point Leonardo made many studies of the surface modelling and dimensions of the horse, mainly from the life but, as here, with a distinctly classical appearance doubtless inspired by the ‘Regisole’, a Roman equestrian bronze at Pavia, 20 miles (30 km) south of Milan (destroyed in 1796). Leonardo prepared a full-size clay model from which a sectional mould was made, but in November 1494 a French invasion of Italy caused Ludovico to send the bronze intended for the monument to his father-in-law Ercole d’Este, Duke of Ferrara, to be made into cannon, and work on the project was abandoned. The drawing medium of metalpoint makes use of the fact that when a metal stylus (usually silver) is drawn over the surface of a sheet of paper coated with a preparation of finely ground bone, it leaves a trace of the metal as an opaque grey line. Varying the pressure on the stylus does not change the character of the line, and as the mark cannot be erased, drawing with the metalpoint demands great discipline and was thus used to train young artists in fifteenth-century Italy. Leonardo attained total control over the medium, modelling surfaces of great smoothness and luminosity using only dark lines; but in the early 1490s he began to experiment with both black chalk, which had been used only sporadically by Italian artists, and the novel medium of red chalk, both of which allowed greater spontaneity, deeper shadows, and the less laborious attainment of a gradation of tones. Leonardo soon abandoned metalpoint, and when he returned to Florence from Milan in 1500 his example encouraged a new generation of artists (including Raphael and Michelangelo) to exploit the advantages of chalk.